After I wrote the post about the near-miss with peanuts (link), I was a little worried that I was starting to lose my mind. With three kids and a recuperating spouse, I can occasionally overlook some of the details. 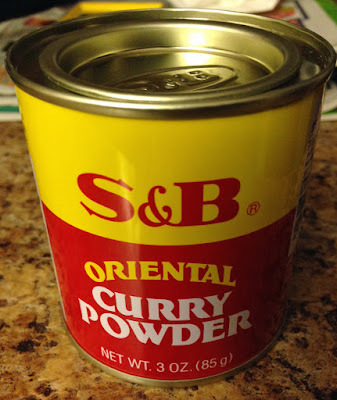 So, I thought that maybe we'd somehow bought a different brand of curry than usual. 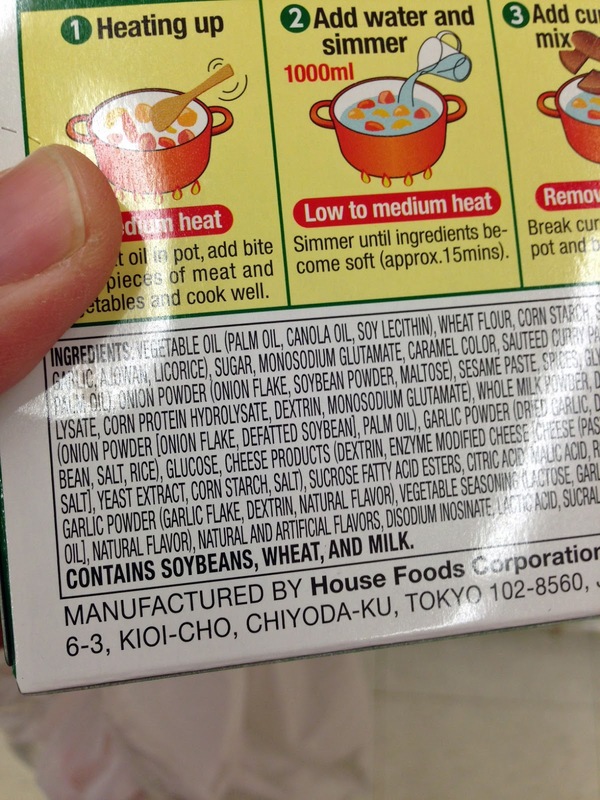 I mean, a manufacturer doesn't just suddenly change the ingredients of a widely-sold item to include an unnecessary but deadly allergen, right? Right?!?!! The life-threatening box of curry paste. 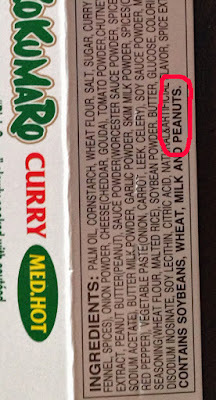 I actually dug this out of the trash to prove to myself that the ingredients did indeed include peanuts. Then, I carried this box around with me for a week, as if it was an invaluable piece of evidence that I couldn't let go. Despite what I wrote in the blog, I spent most the last three weeks worrying that we'd simply made a big, almost catastrophic mistake, and I was having trouble getting over it. Living with severe food allergies makes it hard not to beat yourself up and/or be riddled by paranoia, especially after you realize how easily you could have harmed or killed your child with food YOU helped prepare for dinner. For obvious reasons, I just couldn't let it go. 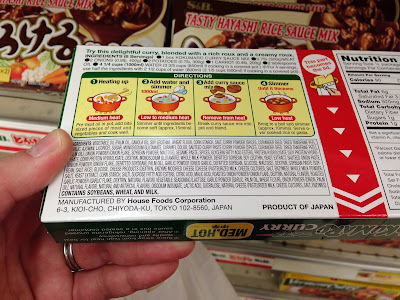 So, Saturday, when we visited our favorite Japanese grocery store, I felt compelled to go down the curry aisle and double check the ingredients of ALL the curry being sold there. I don’t know what I expected to find, but I certainly DIDN’T think I’d find THIS. It's the same brand and flavor of curry, but look! What the heck?!?!! 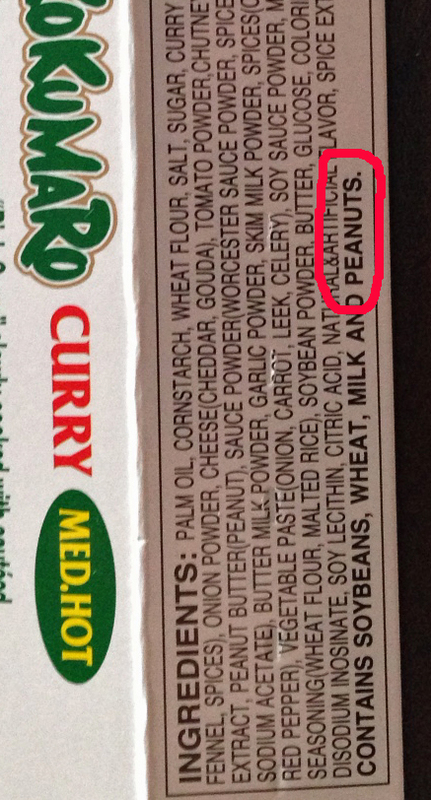 It’s the SAME brand and flavor of curry as the one that had peanuts in it, BUT, there are no peanuts now! The peanuts somehow magically disappeared. That means that, more than likely, they WEREN'T there when we bought the same product previously. Which means that just maybe I am not losing my mind after all! 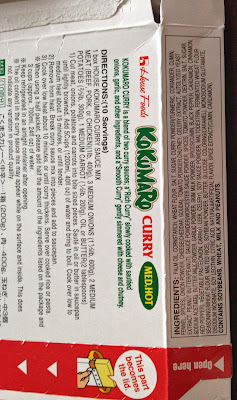 The whole experience has made Ren and me pretty apprehensive about using pre-made curry paste. 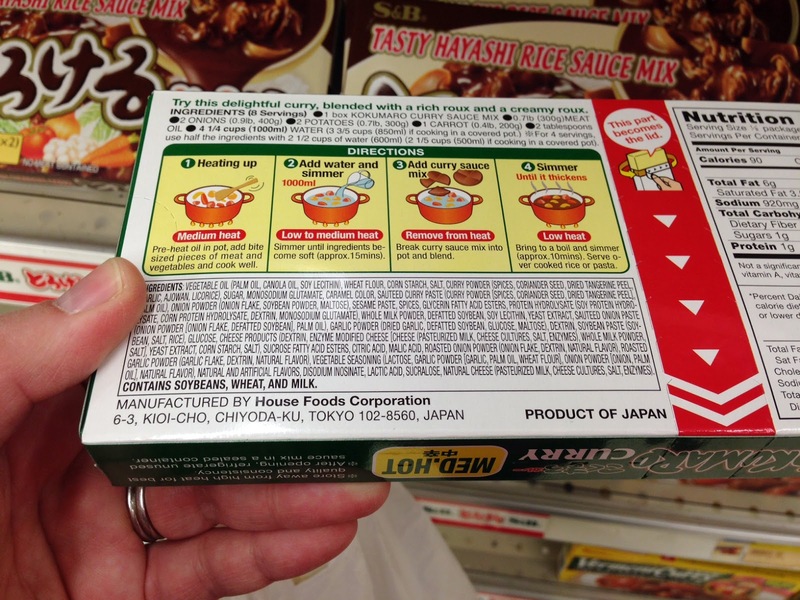 So, on our last visit to the Japanese grocery store, we bought a can of Japanese curry powder instead. 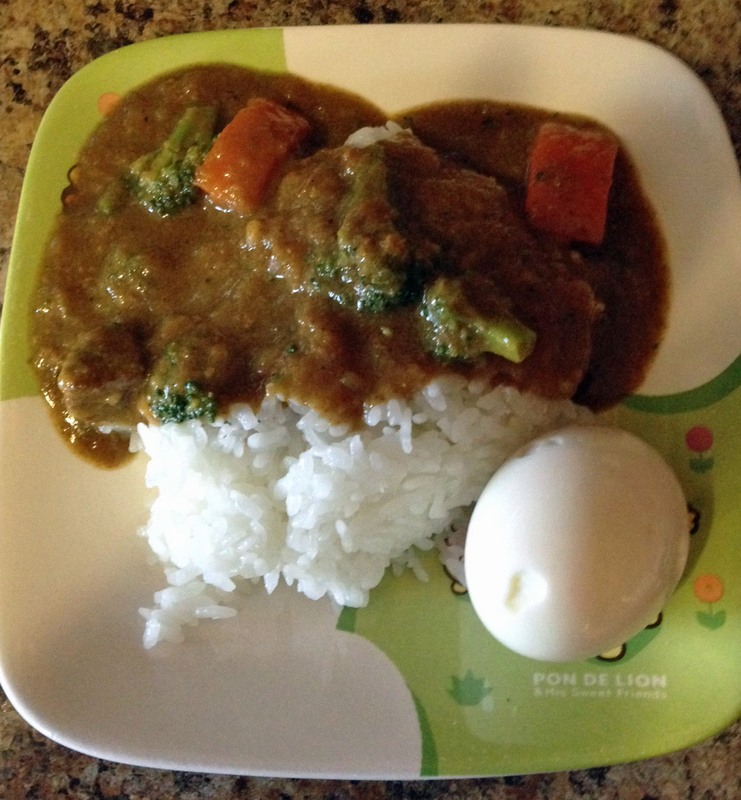 Homemade GFDF peanut-free curry with Easter egg garnish. Verbose and largely unnecessary postscript: Yes, from now on, I still plan to read labels religiously, even of things we've bought many times before. But, at least I feel a little better knowing it wasn't just my imagination. Something fishy WAS going on with the curry. And, yes, the curry paste has a little bit of dairy and wheat in it. It's one of the few things we continued to eat post-dietary changes because we weren't able to find a decent substitute, and more importantly, because the kids hadn't had a negative reaction to it-- at least, not until the peanut incident. Pink P tends to cry. A lot. She cries when she's sad. She cries when she's happy. She cries when she's mad. She cries if someone jumps out and scares her. She cries when her brothers hurt her, or even if she's only received the slightest of nudges. She cries about new food she doesn't like. She cries when I leave. She cries when I come back. She even cries in anticipation, upset about what might have happened even though it didn't. Pink P's crying used to bug me, but I've come to understand that she cries because she's a deep feeler of feelings, and crying is her way of managing all those feels. The problem, though, is that when you have a kid who cries a lot, it can be difficult to ascertain whether or not something serious has happened. We've read the story about the boy who cried wolf to Pink more than once. And, we've gone to great lengths to explain the importance of not overreacting, but our recent eggplant-curry episode demonstrates how hard these lessons are for her to grasp (link). That's what made the The Great Easter Incident of 2016 such a conundrum. I mean, I still don't quite understand what happened, and I've had a few days to think about it. The Great Easter Incident of 2016 was preceded by the Great Easter Basket Hunt of 2016 and the Great Dig Through Your Easter Loot Moment of 2016. A lot of planning and purchasing and hiding of eggs led up to that moment on Easter morning when the kids were quietly checking out their baskets, and I figured I'd earned a few minutes of down time. The instant I sat down to drink my cup of tea, however, Pink gave an almost imperceptible grunt, stood up, and went into the bathroom. It happened so quickly and quietly, I probably wouldn't have even noticed if Stow hadn't announced that Pink had hurt herself. Stow is prone to exaggeration and the occasional lie, though. He also tends to get his descriptors mixed up, so I wasn't convinced anything was wrong. After all, Pink wasn't crying, and she wasn't calling for my help. These are two things she does ALL. THE. TIME. so I figured she was fine. Still, just to be sure, I asked Sky to look in on her. He peeked around the corner into the guest bathroom and said very matter of factly, "She's bleeding." At this point, I figured something must be up, but I didn't think it was too serious (see the paragraph above about Pink's lack of tears and drama). I asked Ren to check on Pink anyway. Ren is EMT-trained and ALWAYS handles the kids' injuries better than I do. When someone is bleeding, Ren's your guy. Ninety-nine times out of a hundred, accidents or injuries are so minor that Ren determines they don't even merit the use of a band-aid. And, given that Pink wasn't crying or panicking, I figured the odds were even higher that whatever was going on with her probably wasn't serious. But, then I heard Ren say, "Wow. You cut it really good!" His Ren's voice had an odd combination of shock and admiration for how thoroughly Pink had managed to cut herself. Now I was paying attention. "Do we need to go to the hospital?" I asked, trying hard to match the nonchalance of everyone else. "Yes," came his reply. "This isn't going to stop bleeding." It was 7:10 on Easter morning. We were all in our pajamas. And, if I know anything at all about Ren, I know that he's right when he says a person needs to go to the hospital. So I got dressed and then helped Pink get dressed (since she was applying pressure to the cut on one hand with her other hand) and drove her to the ER (together with my mom who was visiting for the holiday). Three stitches and a mini panic attack (mine) later, when we were back in the car and headed home, I asked Pink why she didn't cry when she cut her finger. "I was trying to be brave," she said. Of course. The one time she should have cried, she didn't. Thinking about it afterwards, I couldn't help but be amazed by just how calmly everyone handled The Great Easter Incident of 2016. In a house where eating a bowl of cereal elicits something akin to pandemonium, the fact that not one child batted an eyelash when Pink put a deep inch-long scissor cut into her finger reminds me that I can never EVER rest in the knowledge that I actually know anything about parenting these childrren.